The Prayer Kit includes everything you need to create a holy place in your home to spend time with God, Jesus and his mother, Our Lady of Guadalupe each day. Take this time to pray together with family and friends each day. Let us pray that through this time of preparation and consecration that the Diocese of Metuchen will grow stronger in faith and lead to drawing others closer to Jesus. A Prayer Kit will be available at each of the five Masses - 5:15 pm, 7:30 am, 9:00 am, 10:30 am and 12:00 pm. To pick up the Kit, stop by the sacristy at the end of Mass. To return the Kit, drop it off at the sacristy before Mass. You may sign up for more than one time slot. 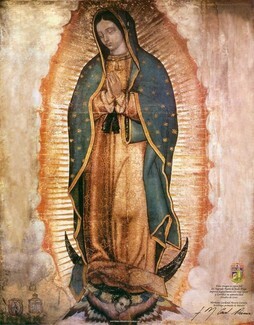 While you have the prayer kit at home, consider viewing the movie, Guadalupe, on St. Bernard’s Community Page on FORMED. There is one for children, too. If you are not yet a subscriber to FORMED, go the St. Bernard website and click on FORMED located in the right hand column to join for free. You may also call the OCF office to sign up for a prayer kit at 908-725-0552 x811.